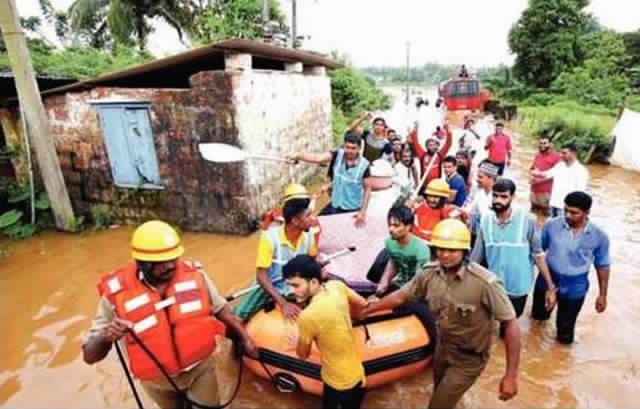 Mangaluru, 10 Aug 2018: Heavy rains lashed across Dakshina Kannada district on Thursday August 9 throwing normal life out of gear. 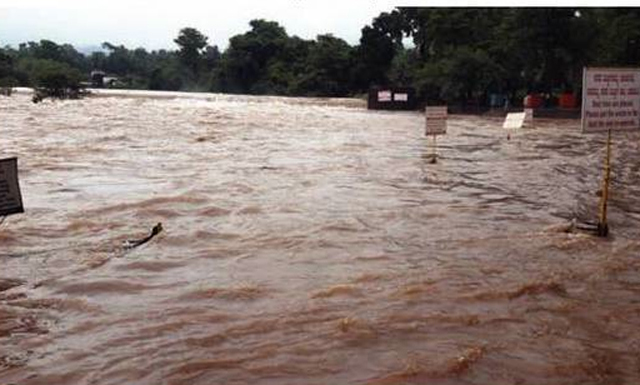 Following incessant rains in Shiradi and Charmadi Ghat regions on Wednesday and Thursday, the water level at Nethravati River has risen and several low level areas have been inundated. The fire personnel shifted people residing in low lying areas in Rayara Chavadi in Bantwal, Jakribettu, Bastipadpu and other places. Bantwal Tahasildar Purandara Hegde led team with fire personnel shifted people affected by heavy rains to safer places. Also necessary precautionary steps were taken in Shamboor AMR and Thumbay dam before it reached the danger level. A family had a miraculous escape here in Neria in Belthangady following a deadly landslide. A huge rock hit the house wall of one Renny on Thursday night. Her husband Vincy, children Priya and Prince escaped unhurt in the incident. Renny’s 70-year-old mother who was sleeping inside had minor injuries. MLA Harish Poonja and other representatives visited the site and have assured compensation. Vehicular movement was disrupted for few hours following rain water flowing over Mangaluru-Bengaluru national highway. The Shishileshwara temple at Shishila has been submerged in rain water along with several connecting bridges remaining inundated. Many other parts of Dakshina Kannada also experienced heavy rains on Thursday. Following landslides in Katakeri on national highway between B C Road and Madikeri, the Kodagu district administration has restricted movement of heavy vehicles since Thursday August 9. Deputy commissioner (DC) of Kodagu district, Shri Vidya has ordered the commuters moving from Madikeri-Sampaje road to take an alternative route through Madikeri G T Circle, Mekeri in Virajpete and Talathmane. The movement of bullet tankers, containers and other heavy vehicles have been banned by the district administration. The restriction does not apply to vehicles transporting gas cylinders, milk, vehicles carrying items to schools and other public transport.